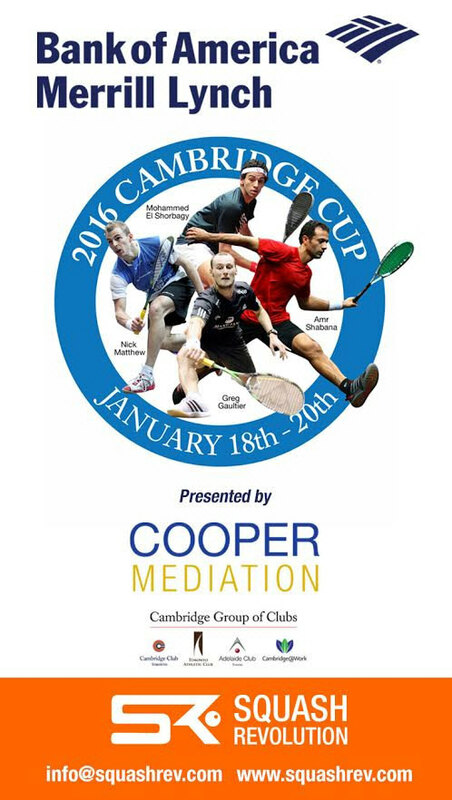 It was Finals night in Toronto and there would be a new Cambridge Cup champion by the end of the night. 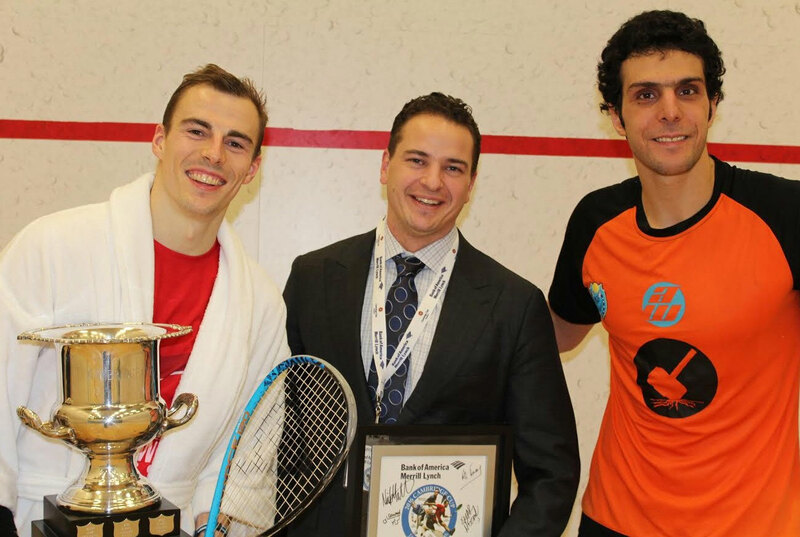 In a heavy-weight engagement, World #3 Nick Matthew battled World #4 Omar Mosaad for the title. First on court was a highly entertaining undercard featuring four-time World Champion Amr Shabana, now the Egyptian National Coach, going head-to-head with one of his disciples, 24 year-old World #22 Ali Farag in the 7/8 match. 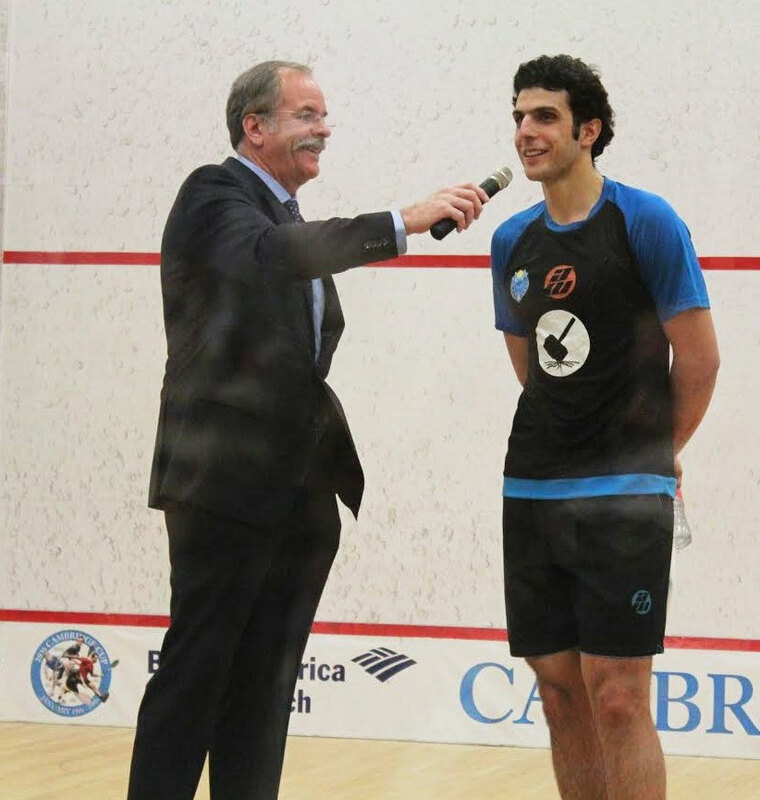 They showed us every shot in the book (and then some) but in the end youth prevailed over experience with Farag besting his childhood idol and current coach in five games. The pump was primed for the Main Event. 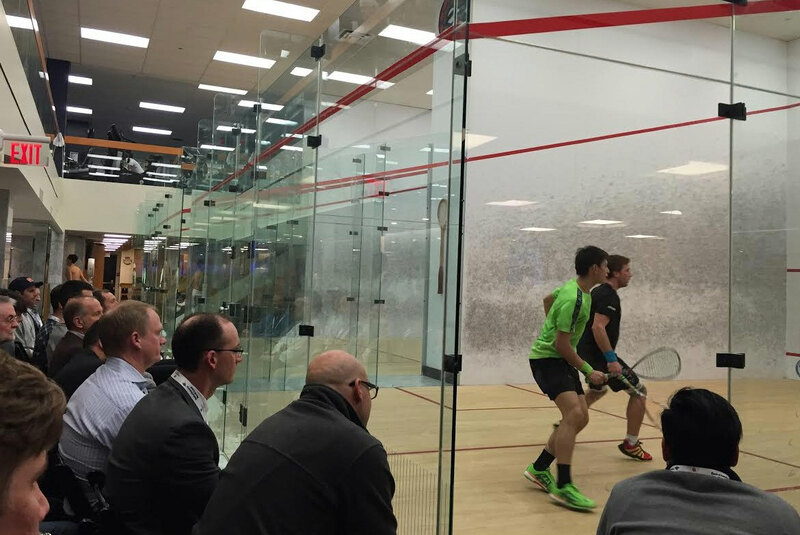 The top two seeds achieved their rankings and stepped on court at 7:48p local time to battle for Canada's most prestigious squash title. The opening rallies were long and measured. It became apparent early that they weren't here to impress the crowd with flair but rather to win the title. 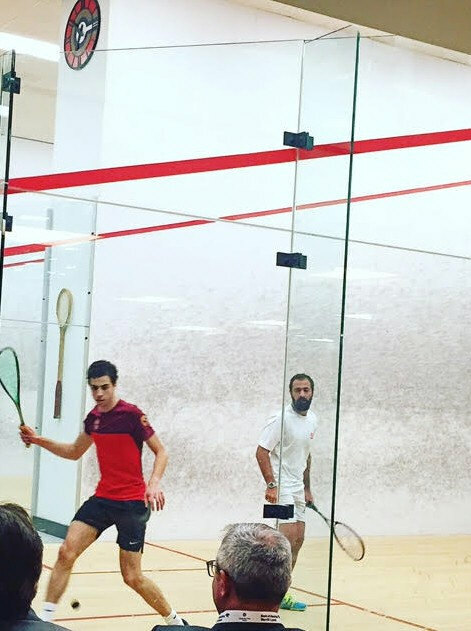 Matthew got out to a 3-1 lead when Mosaad couldn't scrape a tight backhand off the left wall at the end of a long rally, providing the Englishman a straight-drop winner. Playing through some interference in the front right cost Matthew a point when he tee'd up a drop for Mosaad that was 3 feet high. "Should have asked for let. Got punished." he'd mutter to himself. Matthew maintained a small lead until a poor trickle boast at 6-4 never fooled Mosaad, who took one step forward and crunched it into the open crosscourt to pull within 1. Mosaad hit a forehand winner and followed up with a crowd-pleasing crosscourt kill to take his first lead of the game at 7-6. The stayed deadlocked to 10-10 when both players, sensing the importance of the moment, upped the pace significantly. Mosaad got bailed out when a loose ball got straightened out by the crevasse, sending it back wallpaper tight. As we all know, crevasse giveth and it taketh away and on the very next rally, it spat one out back into Mosaad's chest for a stroke. Matthew won the game 13-11 on the next point. The big Egyptian was moving his opponent well in the early-going of Game Two, getting out to a 3-1 lead on a drop-cross-drop combination that would put some mileage into the legs of Nick Matthew. Starting to feel it, Mosaad fired in a couple of near-miss backhand crosscourt kills in a row. He'd pay for it on the second when Matthew pushed in a simple drop in response. Matthew played down-the-middle crosscourt at 7-5 catching Mosaad off guard. But the World No. 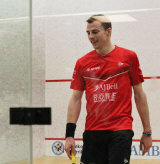 4 got just enough on it to get it back to the wall and Nick Matthew crossed the next shot out of court. "He's so big!" was the only thing the Yorkshireman could say after his lob at 9-6 ended up in the crosscourt nick at warp speed. They played it tight into extra points again but MicK Matthew's experience showed through, stringing together three excellent shots in a row at 11-10, eventually forcing his opponent into a backwall boast. A straight drop later and it was 2-0 in games for the Englishman. They'd jab their way to 5-5 tie in Game Three when a questionable Mosaad pickup was followed by an even more questionable stroke call against Nick Matthew. The crowd groaned, audibly voicing it's disagreement. One fan wondered aloud if the ref's badge read WSF or WTF? No one giving an inch, they'd fight their way through 7-7, 8-8 and 9-9 ties. But the softest of crosscourt gravity drops by Mosaad sent Matthew chasing from the front right to the front left, only watch the balls roll out DOA in front of his outstretched racquet. 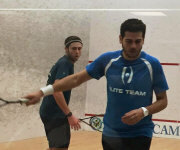 Mosaad on the board with an 11-9 'W' in Game Three. Not wanting to see a fifth, Matthew came out firing in Game Four, burying a crosscourt winner to take an early 1-0 lead. The intensity was ratcheted up as evidenced by the three let calls in a row at 3-all. A correct guess to the forehand volley by the Englishman kept him in the rally on the next point but Mosaad hit the shot of the match off his weak return, backhanding a spectacular wide-angle crosscourt roller from just in front of the front left corner. 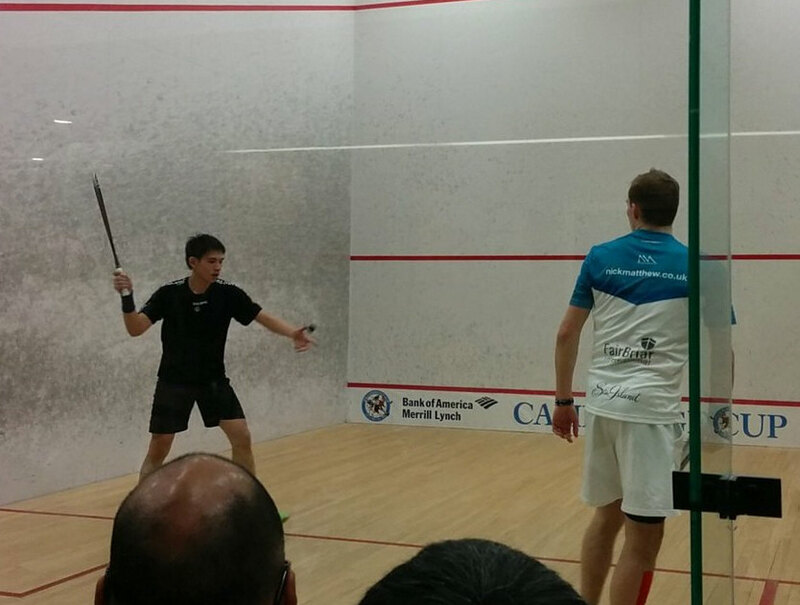 Mosaad got a generous stroke call with a broken string moving him to 6-5, much to the chagrin of Nick Matthew. "He's allowed to play with a broken racquet." the ref would respond to his complaint. A new racquet wouldn't be enough for the Hammer of Thor though. Feeling hard-done by, the Englishman seemed to step up the court and step up the pace, effectively neutralizing the colossal power game of his larger opponent. 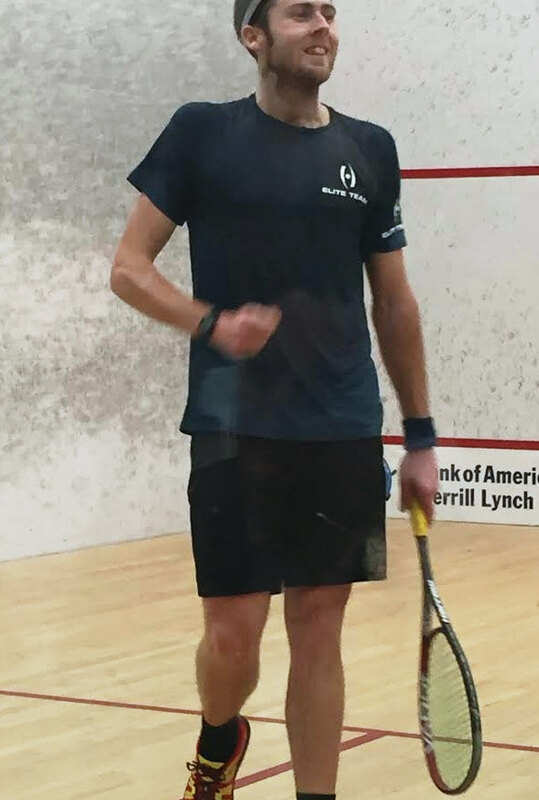 Knotted at 7-7, Matthew leaned on the experience of winning three World Open titles and put the pedal down. He'd win the match on his first gameball, smashing a loose offering for a crosscourt winner to secure the match 13-11, 12-10, 9-11, 11-7 in 59m. 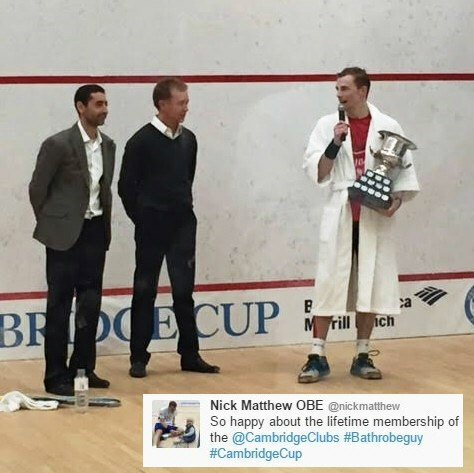 With his first Cambridge Cup title, he won a lifetime membership to the Cambridge Club. 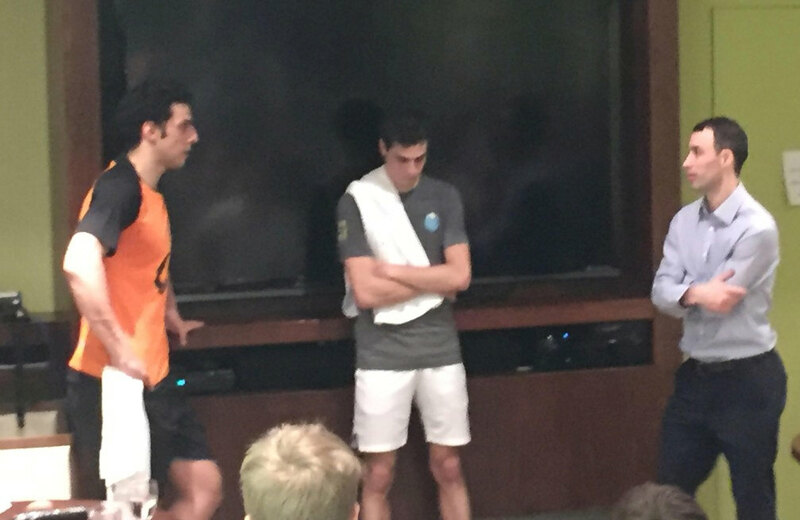 "With no Gaultier and no Shorbagy, I saw this as a great opportunity to get my hands on that bathrobe!" he'd joke in his victory speech, referencing the famous Cambridge Club robe that came part and parcel with his prize package. 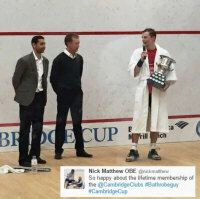 First up on the card was three-time World Champion Nick Matthew versus first-time Cambridge Cup participant Max Lee. Matthew jumped out to a quick 2-0 lead, employing his down-the-middler from the front left twice in the first two rallies. These guys didn't opt to go measured out of the gate and feel each other out but rather brought the attack from the get-go, firing at the nick whenever the opportunity presented itself. They'd stay close all the way up in Game One until Lee pulled ahead on a series of tight straight drives that Matthew couldn't scrape off the wall, pulling away to a comfortable 11-7 win. Not wanting to get behind the eightball, the Englishman started Game Two in his 'office', pushed well up the court in a high-tee position. Lee floated a cross-lob onto the Englishman's forehand that resembled more of a feed, allowing Matthew to put it away with his patented forehand short kill. Down 4-1, Max Lee shot one in on the forehand that was up enough to be retrieved but left Matthew showing his cards, all his eggs in the forehand basket. A hold and crosscourt drive later and the Hong Kong native had cut the deficit in half. 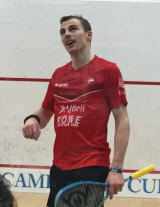 Having gone to the well one too many times with the middle-shot, Nick Matthew saw a crosscourt winner ripped by his right ear when it failed to have the desired effect of handcuffing his opponent. They'd exchange crosscourt winners off the server at 8-5 en route to a 9-9 knot. A long, straight, patient rally followed with Lee finally slotting a tight halfcourt nick winner once he'd earned a loose ball on the forehand. But Matthew gritted his teeth, buckled down and took the game in extra points 13-11 to square up the match. 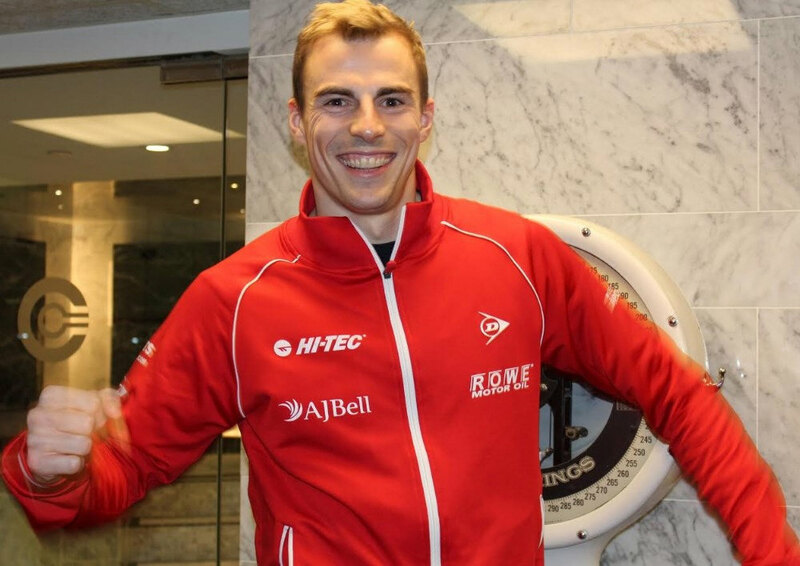 At 2-0 in Game Three a devastating hold by Nick Matthew left the Hong Kong national literally floored, feet coming out from under him as he dove forward in vain. Mr. Lee had a couple of tricks of his own, wrong-footing the 3x world champion in successive rallies to draw even at 2-2. Matthew slotted back-to-back forehand and back winners and then made Lee pay on a missed cross-court kill attempt, softly redropping for a 6-4 lead. It was Matthew being Matthew from then on, winning points despite weathering immense pressure by retrieving winner after winner until Lee finally smashed one into the tin. A spirited effort and some well-constructed rallies notwithstanding, Matthew grinded his way to a 11-7 'W' in Game Three. Lee never led in Game Four, stuck a point or two to the English juggernaut throughout, in spite of a seriously valiant effort. 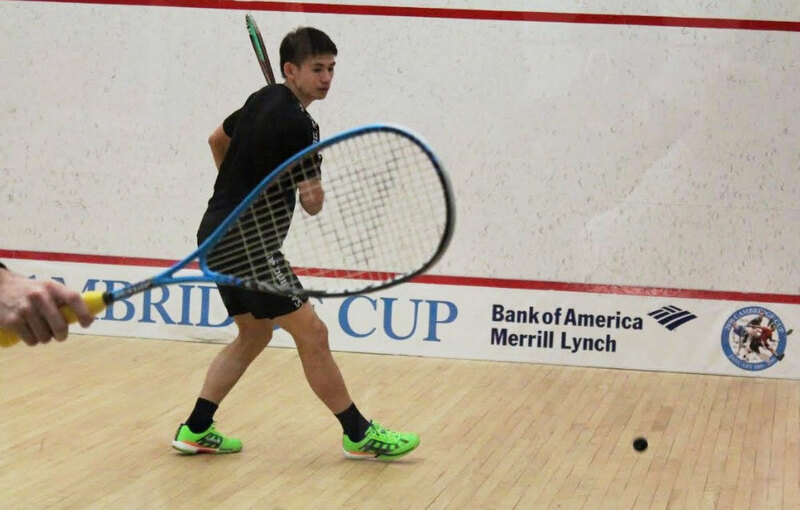 Down 5-6, Max Lee was able to move his opponent to back and forward, back and forward and then finish with the silkiest of backhand drop once he had him open. 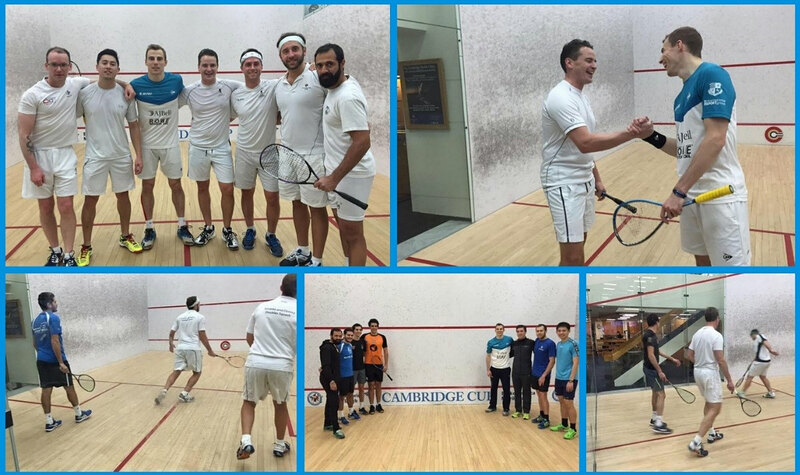 They'd remain close until a mammoth 106 shot rally at 9-9 that left the players doubled over and the Cambridge Club crowd hooting and hollering in appreciation! "Rally like that should be winner takes all," quipped Matthew. Smelling blood, the Englishmen stepped up the pressure, taking every ball as early as he could and putting Lee in some compromising spots. Max absorbed and defended the best he could but, as the expression goes, something had to give, and the World Number 12 fell 11-9 in fourth. 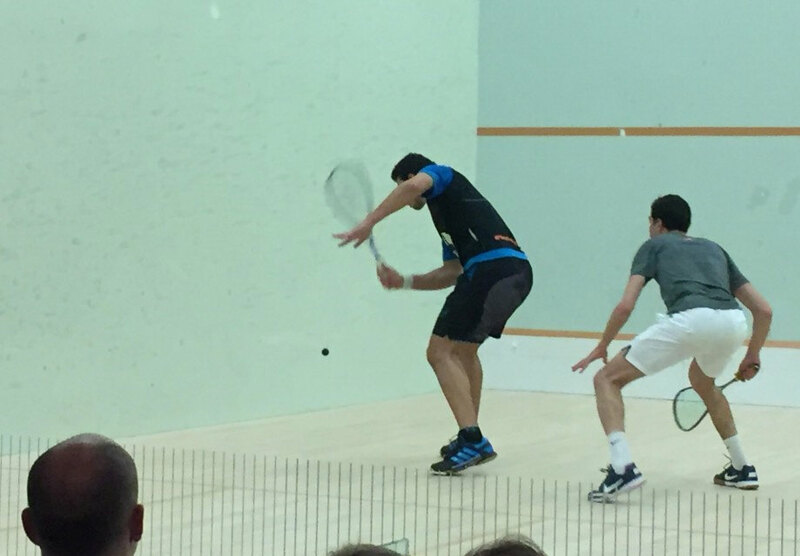 Next up on Centre court was World #4 Omar Mosaad taking on the surging Australian left-hander Ryan Cuskelly. If you'd never seen Mosaad play, it would not have taken long to figure out how he got his nickname 'The Hammer of Thor'. He came out absolutely punishing the ball. He was hitting it so hard that Cuskelly, down 3-2, lamented "I'm just trying to warm up here! He's crushing it!!" Cuskelly brought some good, penetrating length to the game and managed to keep it close at 4-5. 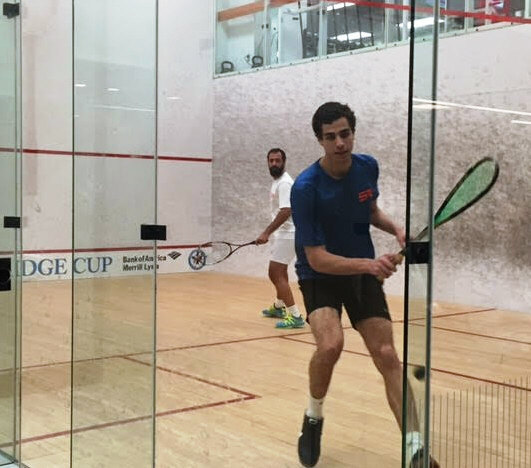 A quick-fire series of crosscourts hit from inside the short-line had long-time tournament supporter Mike Capombassis nodding with approval from behind his Pinot Grigio (or was it Chardonnay?). These two guys brought the fireworks. Forget playing it cool, not risking the error at 8-all and 9-all. Hard-angle crosscourt nicks from 3 feet off the frontwall were the norm for Cuskelly, never turning down the dramatic shot. 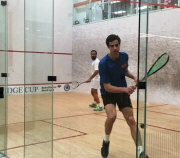 Down gameball 10-9, Mosaad was forced into a big, defensive boast from the back left that Cuskelly jumped all over, hammering it behind the Egyptian's momentum, back to where it came from. Game to Cuskelly 11-9. 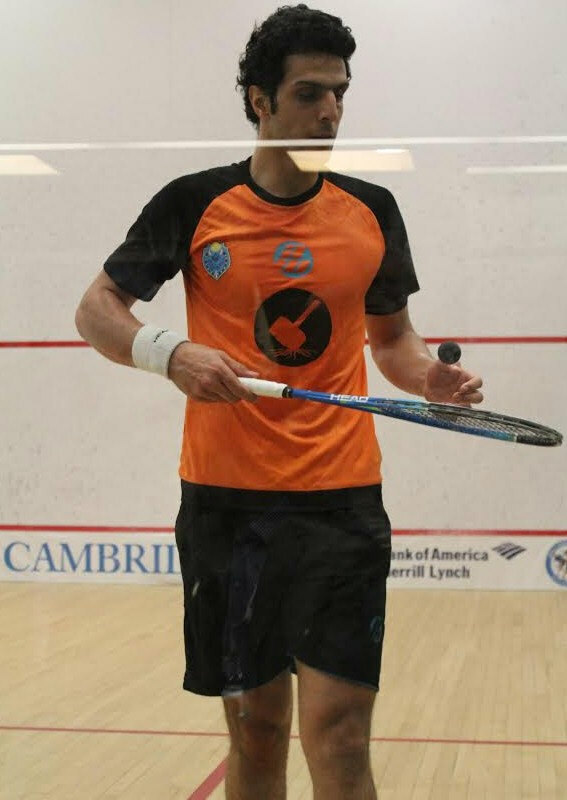 Imagine for a moment that you're one of the hardest hitters on the PSA Tour, one the purest, hardest hitters of the squash ball in the history of the game. 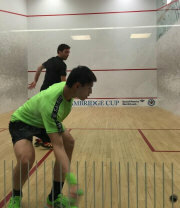 You find yourself down 1-0 in the semis of the Cambridge Cup. What would you do? If you said, I'd hammer the snot out of it then you are on the same page as Omar Mosaad. He came back on court and hit the ball so hard that it's going to have to seek counseling. Even the educated Cambridge squash crowd was in awe of just how hard the 27 year-old Egyptian could hit a squash ball. Combined with the silky smooth hands of a surgeon when called upon, he makes for one helluva player. Pounding his way out to a 9-4 lead, he buried Cuskelly in the back right corner where he lost against the navy blue carpet. "I can't see!" he complained. First time at the club, Mr. Cuskelly? A flattened Mosaad backhand kill would end Game Two and tie the match at 1-1. The southpaw Australian would keep Game Three close for the early-going but, like Georgia in August, the heat was unbearable. A backhand width and forehand hammer crosscourt kill would put Mosaad ahead 7-3 and have central referee Wayne Smith wondering aloud if the needed a conduct warning for "Ball Abuse". Not to be outdone, Cuskelly flattened a backhand drive from depths of the court into the short nick to keep his campaign afloat. "That was gonna roll!" he'd say of another spectacular wide-angle crosscourt kill attempt that found the tin instead of the nick. 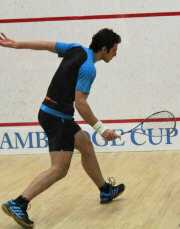 His next backhand drop also tinned, sealing the game for Mosaad 11-8. More of the same followed in Game Four with Omar Mosaad pumping screaming drives into the back and Cuskelly doing his best to weather the storm. His pace and power opening up the short-court, Mosaad went up 5-3 with a trickle boast that caught Cuskelly on his heels. The powerful forehand kill he put down at 7-3 was so good that Mosaad had to give himself props, turning to the crowd to ask "What? No applause?" eliciting a chuckle. Cuskelly didn't fold and brought it all the back to 8-10 where Mosaad would earn himself a cross-court drive into the open court only to have his winner clip the top of the tin. Undeterred, he dropped the hammer on the next serve, crushing his forehand receipt into the cross-court nick to earn himself a place in tomorrow's final. 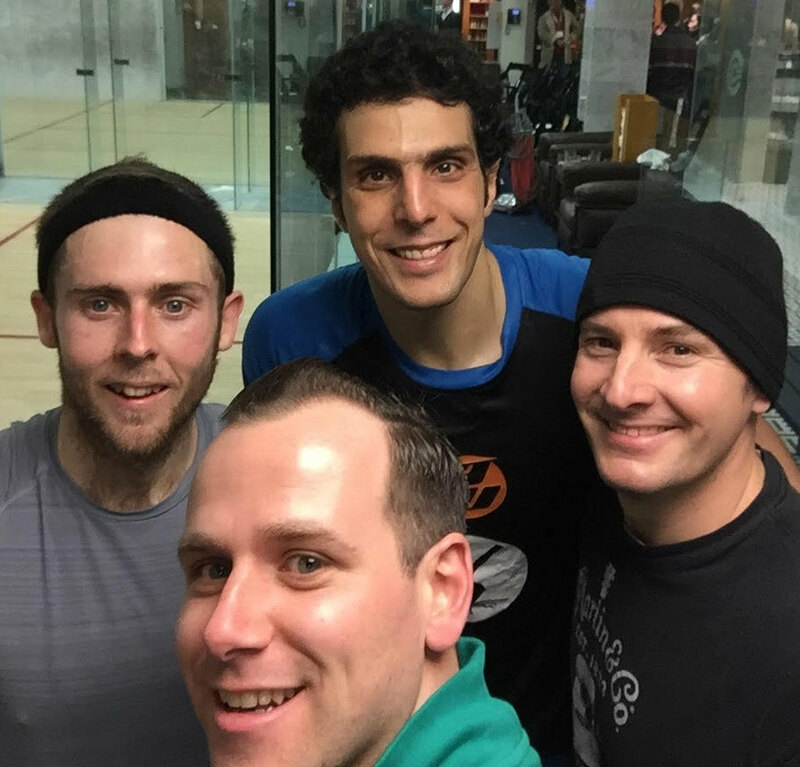 The Adelaide crowd were treated to an amazing display of squash between rising French star Mathieu Castagnet and Egyptian grandmaster Amr Shabana. Castagnet started strong, using his trademark strength and fitness to put pressure on Shabana, extending the rallies whenever possible. Shabana started to find his rhythm but it was the Frenchman who finished the stronger of the two, first game Castagnet. Game 2 saw Shabana build a great lead, pushing up the court and attacking on the volley more. Castagnet was working hard to stay with the maestro but it was the free flowing Shabana who took control of the T and the game. The third game was a great contrast between the rhythmic, smooth moving Shabana and the determined, fast paced Castagnet. Two brilliant straight drops at 9 all was just enough for Castagnet to edge the game out. Building in confidence and moving better as the match went on, Castagnet leapt out to a big lead in the fourth, only to have Shabana reel him back in with his best squash of the match, demonstrating the perfect straight line hitting that saw him become the most dominant player of his era. It was the Frenchman however, who managed to hold on in a tight finish to close the game and match out. 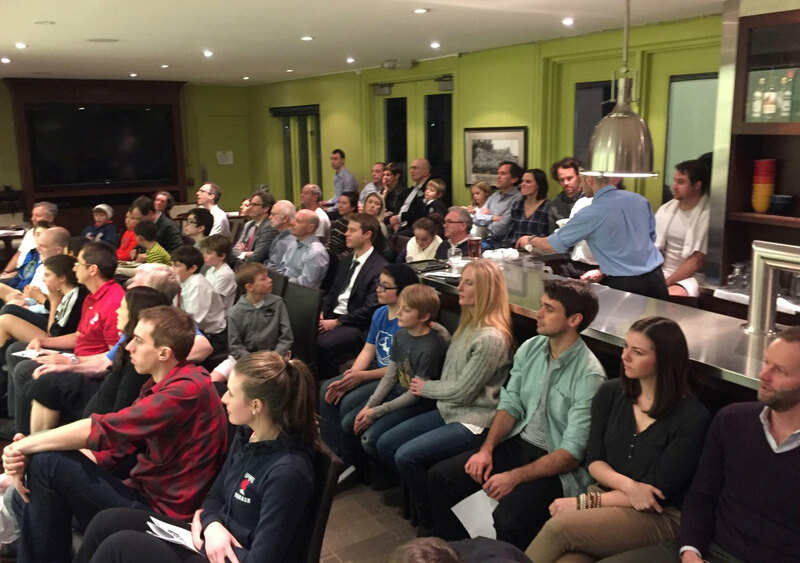 A thoroughly appreciative crowd gave the players a huge round of applause and were then treated to a question and answer session with some fascinating insight into life as a squash professional from the players. 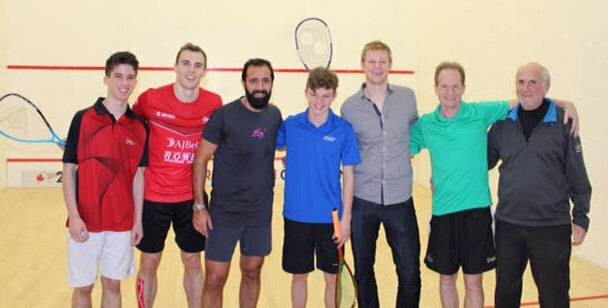 A great night all around - the recently retired Amr Shabana, showing everyone why he is rightly regarded as a legend of the game and the irrepressible Castagnet, who looks full of confidence and will be looking to build on recent impressive performances. 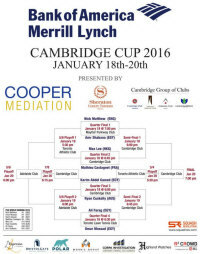 Cambridge Cup Quarter Final Action commences on this Monday night at the home club. Aussie native Cuskelly and the late entry Gawad face off to kick off the roars at the Cambridge. Both players are fresh off of last weeks excitement at the Tournament of Champions hosted at Penn Station in New York, where both had impressive finishes. Back at it. Things start off in true PSA fashion with a 47 shot 'feeler' rally to get the blood flowing and Gawad strikes first blood with both players giving big sighs after rally #1. 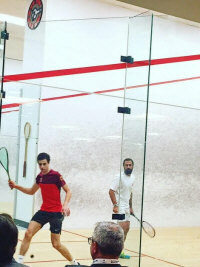 It's clear that these are a couple shot makers on court starting with Gawad stepping up early with quick counter drops, nicks and trickle boasts showing glimpses of his Egyptian Idol Ramy Ashour early. Cuskelly, is upto the test, making Gawad hit 5 shots more than he thinks he has too because he's digging everything and pouncing to showcase his finishing strikes on Gawad with left handed nicks and front right backhand holds that are freezing the unfreezeable Gawad. 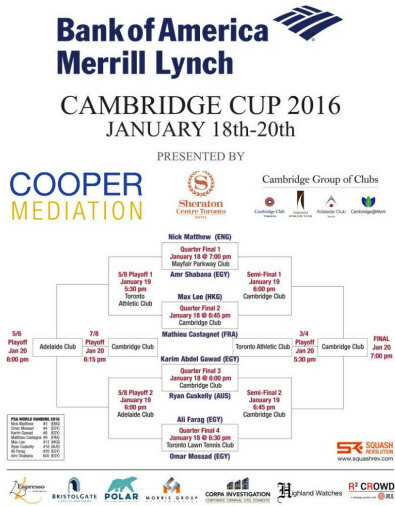 Bit of a tug-o-war on our hands tonight with both pros looking to make their mark at the Cambridge cup. The Egyptian's accuracy is spot on with painted drives, tear drop lobs and not forfeiting any errors, Gawad prevails in Game 1. 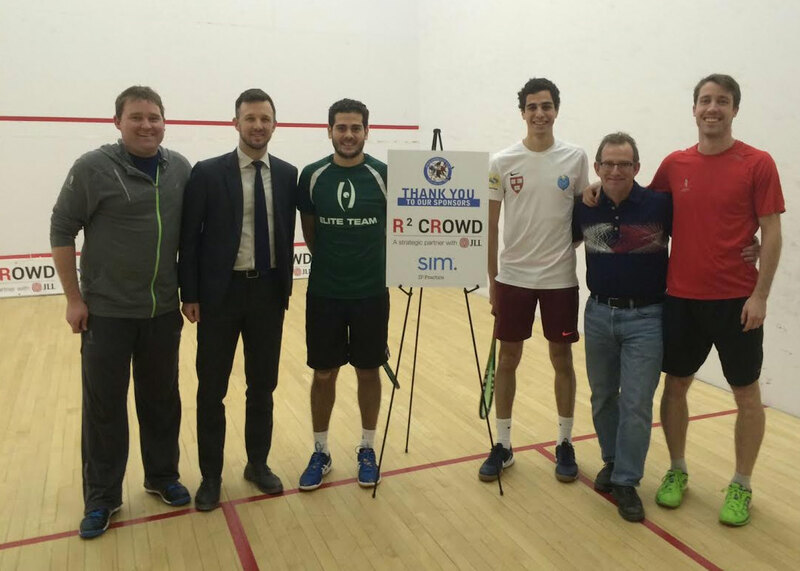 Back at it and Gawad comes out firing with a forehand cross court nick into the front left corner. The next rally was a dog fight, but again Gawad finishes with a nick. Now Cuskelly was getting a bit of a snarl going and keen to stop the bleeding. The aussie gets a jump in his step and starts commanding the court, smashing penetrating drives that are pushing the pace of the match and then quickly slowing it down catching Karim over committing to the front with a straight flick lob 4-5 Karim, with Cuskelly pushing. Ryan keep the position and mixing in some great variety, carving in drops from the back and hitting tight angle down the wall nicks ... 10-10. 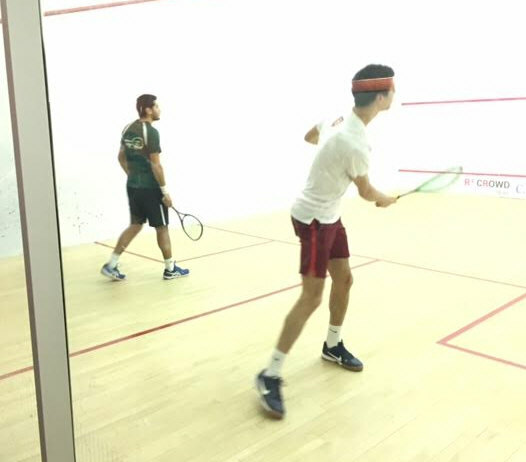 Next up Gawad steps into what is sure to be a cross drive and Ryan bites as Karim finishes the ball with a forehand straight drive with Cuskelly looking from afar. Not enough though as Ryan digs in and hits a quick power trickle boast and a dying length to finish things off in game two ...13-11 All square. Game 3 is under way and both combatants are now invested in the match and shirts are well soaked through. A jockeying contest gets us half way through the 3rd with a sprinkle of errors that were obsolete in the first two from both parties. Ryan draws things even with a beauty mid-court hold cut drop that is executed perfectly ... 6-6. Cuskelly keeps mixing and after a short, short, short exchange, turns his wrist over from the front left rolling the ball cross court with top spin into the dead nick ... incredible to witness. Next rally more pressure from the aussie and Gawad moves to track the front left drop and mis steps, scraping his knee ... injury timeout for the Egyptian. The aussie raises his brow to the crowd and after 3 minutes of stoppage gets caught flat footed by rejuvenated Karim who quickly wins 11-9 coming back from 8-9 down. On to Game 4 and Ryan is playing hungry for a quick comeback and proves successful. He strings some picturesque early shots together with Karim watching, volley gut backhand nick ... Hold backhand straight drive winner ... Tight boast forces Karim to cough up a loose ball, Cuskelly shows power and executes finesse with a touch drop. Gawad wins a few grinding points back but a few late mis-timed decisions allows Ryan to make no mistake, anticipate and attack a late trickle boast from Karim to perfection ... We're going 5. These guys want it ... quick fire rallies almost as if it's a hard hitting contest throwing points back and forth. Gawad shows first blood just catching a couple tins. He snaps out of it and jumps on a backhand front right drop from Ryan and snaps an down the middle drive that jams Cuskelly to get the game to 3-6 for the aussie. Again, cuskelly has a nose for recognizing momentum and killing it with nicks ... backhand cross nick into the front left ... followed by an ambitious tin from Gawad. Ryan pulls it ahead to 8-7 with a dying forehand length. These guys are grinding ... then goes for a quick win ... tin ... 8-8. Who wants it more ... Karim starts to play cautious not wanting to cough up an error and Ryan keeps his eye on the prize and throws up a philly from centre court that is just high enough to tempt Gawad to leap for it, but can only get frame on it and ball goes out. Karim jumps back waiting on an off the back wall return ... double pumps, sells Ryan and finishes the straight dying length drive into the back. Still, not enough Gawad falls to Cuskelly's finishing pressure and the Aussie prevailed in the match of the night 11-8 ... 3-2 Ryan Cuskelly world #16 over world #8. And their off, both players full of energy getting off to a quicker start than the previous match Castagnet is going for it kicking things off with a backhand nick. Max returns the favor, with sheepish glares being exchanged. Exceptional footwork and dying length on full display with these two moving the ball around well and tracking it effortlessly ... 7-7. After a straight backhand exchange Mathieu hits a off the back retrieval and Max ofcourse decides to hit a sharp angle cross nick standing about 4 ft from the front left ... rolls ... unbelievable and even Castagnet has applause for the Hong Kong descendant. Grinding 53 shot rally ensues with both guys groaning into the back corners already in game one. Max just has the extra step in game 1 and closes the door. Game 2 underway and both competitors decide to display their short game in a fast but soft exchange and Catagnet ends it with a fake power soft forhand cut drop into the backhand nick from mid front court. Here they go again, 43 shot rally from front to back, side to side, lob to drive and yet again Max prevails by getting one shot more than the Frenchmen. Lee is human apparently and gives back a few gifts as Mathieu starts to execute his precision ball striking with cut volley drops and hold drives causing Max to hesitate a half second. Castagnet finishes game two in style with a down the wall nick drive from the backcourt, where no one thought a nick was possible ... incredible. 1-1 in games 12-10 in both, tight contest. Game three and again back and forth they go with quick dynamic rallies showing their incredible range of movement forcing the other to hit multiple winners. Mathieu goes up early with Max going for a little much and starting to catch a few tins as Castagnet is applying pressure. Max re-sets keeps the ball both short and long, but incredibly tight forcing Mathieu to cough up too many to comeback from 11-7 Max. Game 4 and Castagnet wants more, really settling into the match and performing for the crowd with some quite comical showmanship, he quick steps squeeking his shoes on the surface trying to trick Max into thinking he's running to the front, but Lee is cool as ice and pushes the tight drop into the front right with Mathieu glued to the back wall 7-5 Max. Now Castagnet leans in, hitting lenth with purpose and tight, squeezing out Max into the back corners. Then the Frenchman shows power and cuts in perfect drops that are spinning into the right wall and causing them to barely bounce ... too good for Max and France prevails in the 4th ... we’re going 5 , again. Castagnet wants it early, just retrieving get after get, but Lee keeps the pedal down and gets off to an early start in the 5th. Mathieu's variety surfaces again when he leaps onto a front left drop and drills an inside drive down the middle pinning Lee's hip not leaving him a chance to react let alone get out of the way ... Who knew he could crack the ball like that. 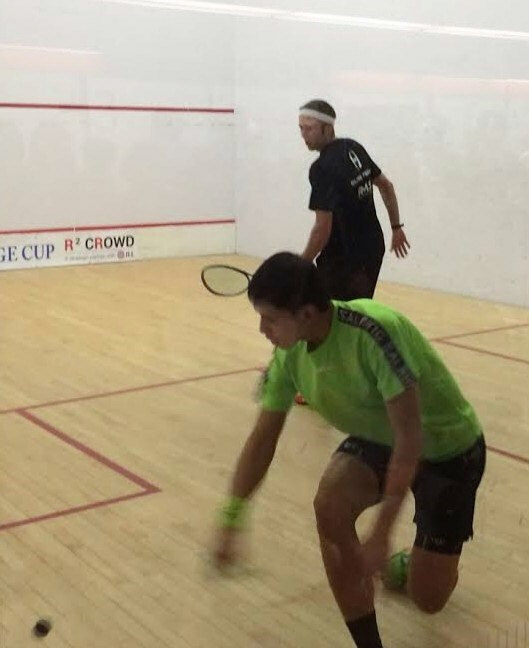 Although, it was Max that turned the tables and ran away with the rest of the game proving to be too strong for Castagnet this week and truly delivering his Maximum performance ... 10-3, 3-2, World #12 Max Lee over World #9. 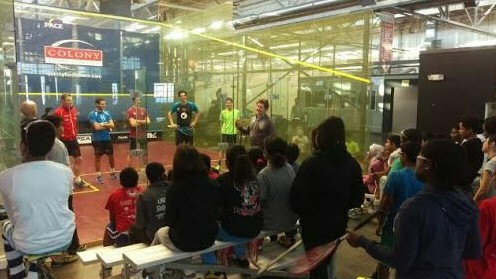 Junior Jam: Cambridge Cup pros visit Urban Squash Toronto! 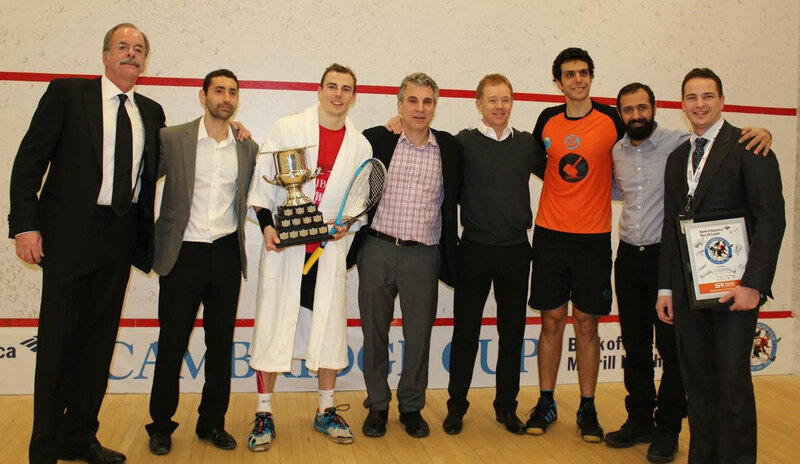 An amazing night at Mayfair Parkway with 3 time world champion Nick Matthew vs 4 time world champion Amr Shabana. It was lively and loud in the crowd with over 100 bodies in the gallery. Shabana tried to move around Nick with his deft touch. 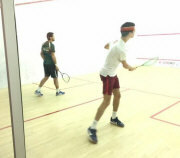 With Nick's strong 'T' control and attacking game he was able to take control of the match. In a spectators words, "they are carving nicks out there", pretty much sums up the match. It was an all out attacking battle that Nick, in world class fashion, came out ahead. 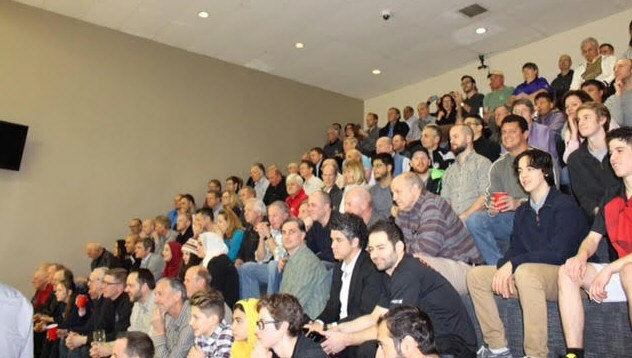 Excitement was in the air as the fans packed the seats at the Toronto Lawn Tennis Club for the highly anticipated match up between the world #4 Omar Mosaad and the young world #22 Ali Farag. Ali and Omar dazzled the crowd with a fast paced game featuring remarkable gets and shots that left members of the crowd scratching their heads wondering "how did he do that?". Ali jumped out to an early lead in the first and was able to hold on to take the 1-0 lead in the match. The second was a seesaw battle but the younger Egyptian was able to win the big points at the end of the game. Down 2-0 in games it was do or die time for the world #4. 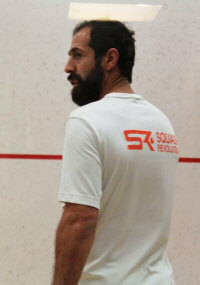 Mosaad snuck out the 3rd and upped the pace in the 4th to level the match at 2 games each. The 5th was a battle of attrition. Mosaad shut down the court as he worked Farag with a steady dose of tight length followed up with lethal drops. Farag put on a remarkable display of retrieving but it was evident that the long rallies were taking a toll on his body. At one point Ali asked for a "time out" to catch his breath (the referee didn't allow it). Mosaad cruised to a 10-4 lead before eventually taking the deciding game 11-6. After the match the fans were treated to a Q&A session hosted by Lawn member and former world #10 Graham Ryding. 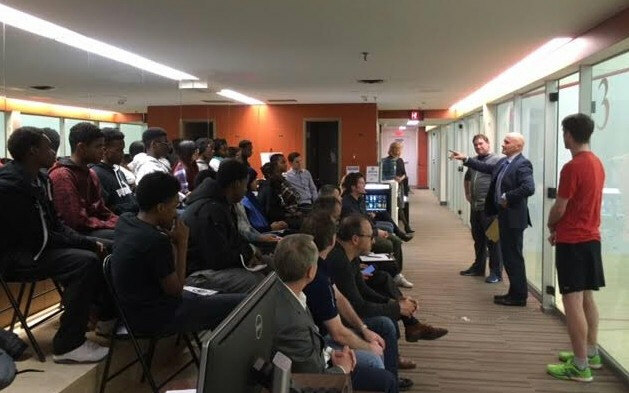 Graham facilitated an informative discussion between the crowd, Omar, and Ali which gave our members some insight to what life is like on the PSA tour. It was a great experience to have Omar and Ali at the club. The duo picked up some new fans tonight and the TLTC will be cheering them on in their upcoming events! 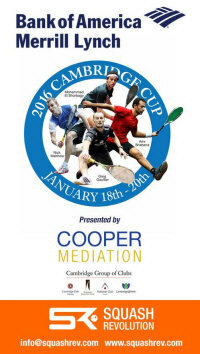 The best squash on the planet will return to Toronto from Jan 18-20, 2016 for the 7th Annual Cambridge Cup. 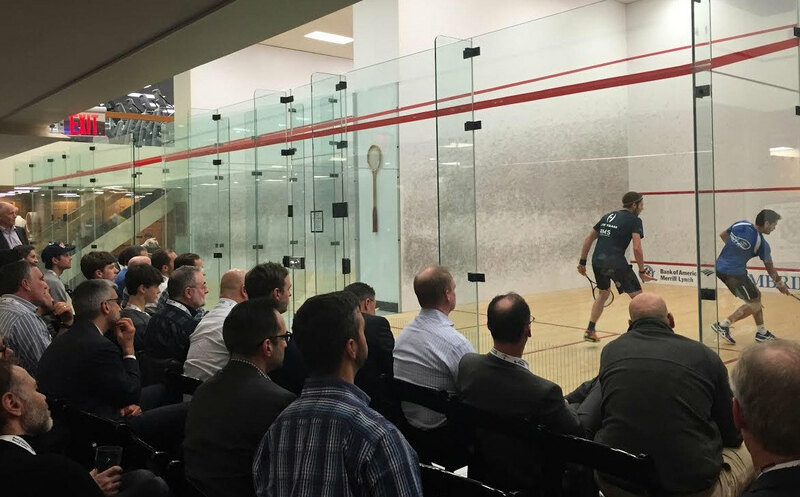 The event boasts some serious pedigree having attracted a veritable laundry list of World Champions, World #1s and squash legends in its six year history. 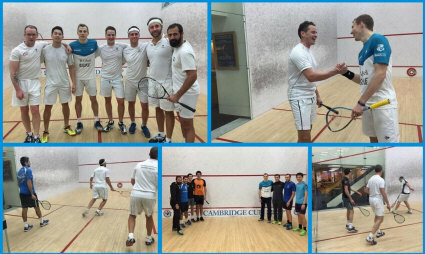 From Power and Palmer to the incumbent, Gregory Gaultier, no less than six World Open Champs have graced the Cambridge Cup courts. This year's installment is no different. 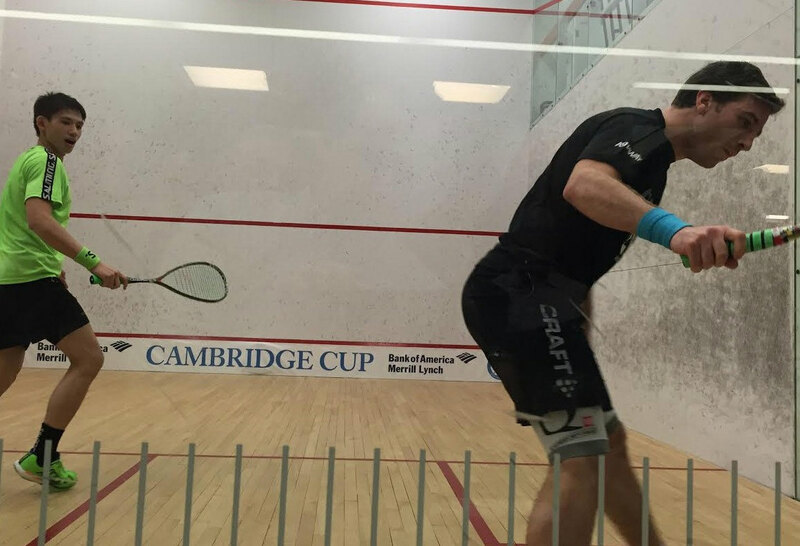 Gregory Gaultier, the man in current possession of both the World Open and Cambridge Cup titles, returns to defend his title against another star-studded field. 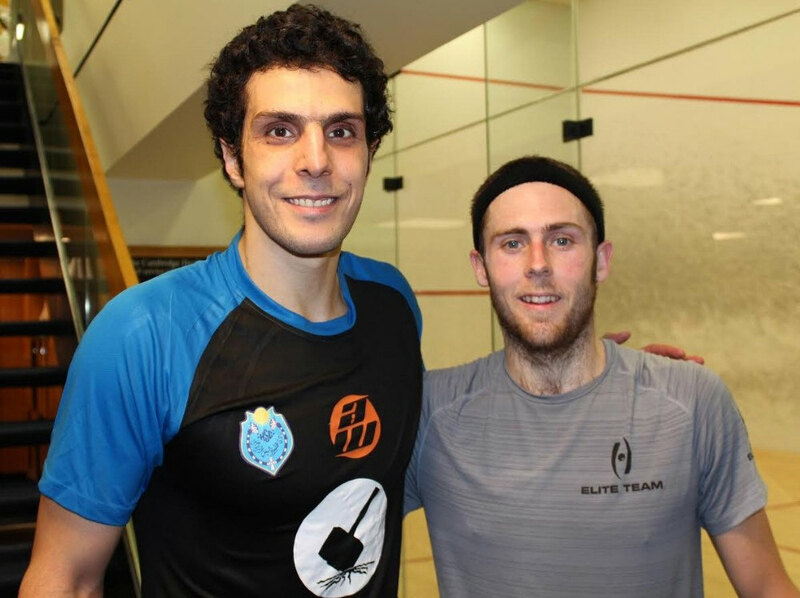 Joining Gaultier in Toronto will be the balance of the current top four world-ranked players in Mohamed El Shorbagy, Englishman Nick Matthew and Omar Mosaad. Four-time World Champion, squash legend and new Torontonian Amr Shabana will also be looking to be the last man standing - for the third time! Rounding out the 8-man draw are Frenchman Mathieu Castagnet (World #9), Aussie Ryan Cuskelly (World #16) and up-and-coming Egyptian Ali Farag (World #22). "We are thrilled and honored to have this impressive field of players," said Tournament Promoter Shahier Razik. 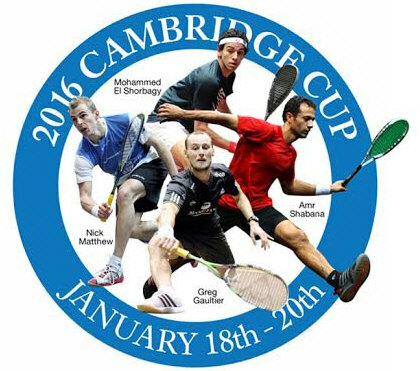 "This is the Cambridge Cup's 6th year in the running. 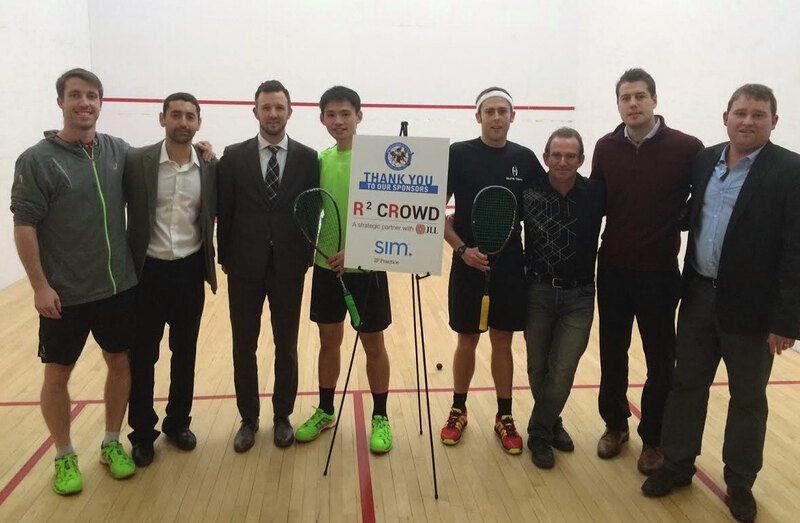 We have seen it grow over the years into a unique and exciting event for players and Toronto squash fans. 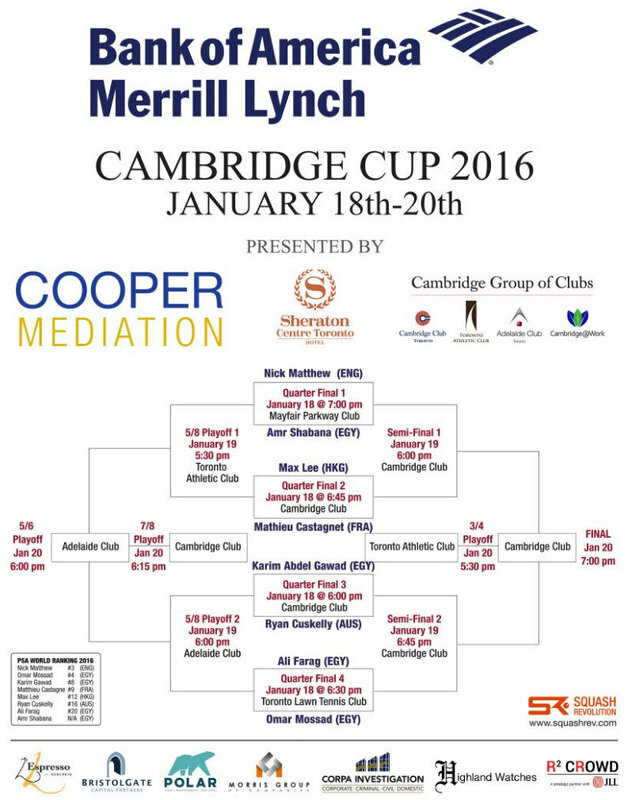 "Thank you to Bank of America Merrill Lynch for their continuing support and the Cambridge Club for its hospitality. We look forward to a great event!" A total of 12 matches will be played across seven Toronto venues. 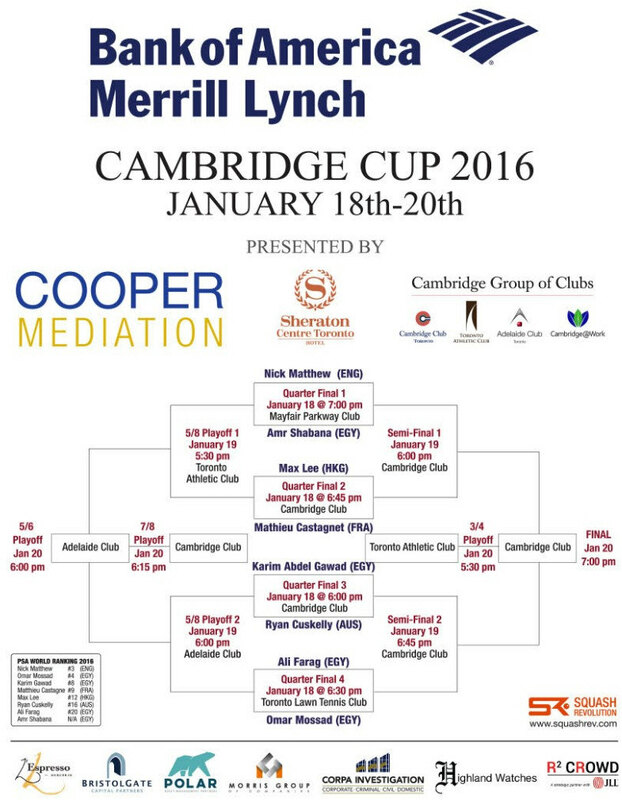 The Cambridge Club will host six matches including the two semi-finals and the final. Based on the history of this event, it is anticipated that event will be completely sold out!